Fifteen-year-old Marcella Cruz won a USTA gold ball in New York, where the National Open Indoor Championships are held each year. The No. 15 seed, Cruz, from Marlboro New Jersey, defeated No. 4 seed Quinn Gleason, a senior at Notre Dame, 5-7, 6-3, 7-5 this morning to win the women's open singles title. The men's open singles title went to Shawn Hadavi, a junior at Columbia. Hadavi, the No. 2 seed, beat Iowa sophomore Josh Silverstein, seeded No. 14, 2-6, 7-6(4), 6-1 in the final. Oregon/St. John's alumnus Gustavo Loza and St. John's senior Vaidik Munshaw won the men's doubles championship. The No. 7 seeds beat No. 6 seeds Danile Grunberger, a Columbia sophomore, and Ethan Nittolo, a Buffalo freshman, 6-4, 6-2. The women's doubles title was won by top seeds Taylor Ng and Katherine Yau of Dartmouth. The junior and senior combination defeated No. 5 seeds Rima Asatrian, a Columbia sophomore, and Kelly Williford, a Virginia Tech senior, 4-6, 6-3, 6-3. The mixed doubles title went to Bucknell senior Nick Bybel and Williford, the No. 7 seeds, who defeated Florida Tech alumnus Keith Kessler and high school senior Jessica Livianu, the No. 6 seeds, 7-6(5), 6-4. At the Winter Nationals, the semifinals are set in the 16s and 18s. 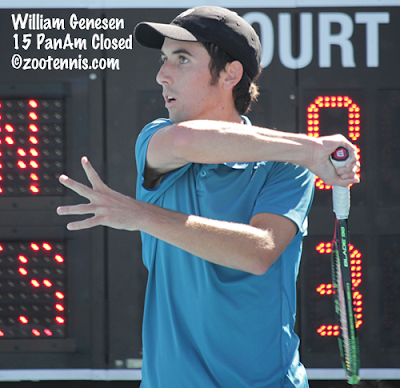 In the boys 18s, defending champion and top seed William Genesen will face unseeded Mac Kiger and No. 10 seed Jason Lui will play No. 8 seed Austen Huang. 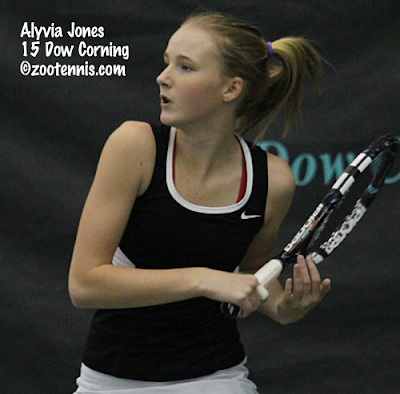 The top seed in the girls 18s was beaten today, with Alyvia Jones, the No. 12 seed, defeating Ena Shibahara 6-2, 6-3. Jones will play No. 16 seed Sydney Van Alphen, and Nicole Mossmer, a No. 17 seed, will play Jessica Failla, the ninth seed. In the boys 16s, top seed Carson Haskins will face Harris Walker, a No. 17 seed, and No. 6 seed Christian Alshon will play Abhijeet Joshi, a No. 17 seed. There are two unseeded players in the girls 16s semifinals. Top seed Sara Choy will meet Sedona Gallagher and No. 2 seed Hannah Zhao will face Naomi Cheong. The quarterfinals are not yet complete at the 12s and 14s in Tucson. The TennisLink site for that tournament is here. My recap of the Junior Orange Bowl, which finished last week, is up today at the Tennis Recruiting Network, and below is the slideshow of the players who made the quarterfinals or reached the consolation finals. As with all the other tournaments, the videos will have to wait until I can find the time to clear some room on my computer to process them, but look for them in January. The album is accessible on mobile devices from this link. 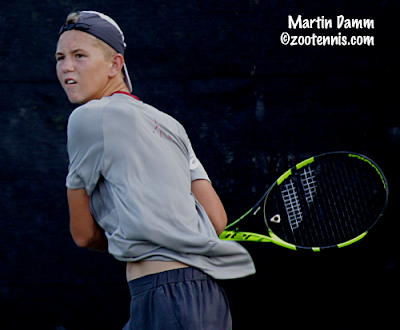 The USTA Winter Nationals will play the round of 16 in all four age divisions on Wednesday, so I thought it might be a good time to catch up on what has happened the past three days in Arizona. Below you can find the status of the Top 8 seeds and the names of the unseeded players who have reached the round of 16. 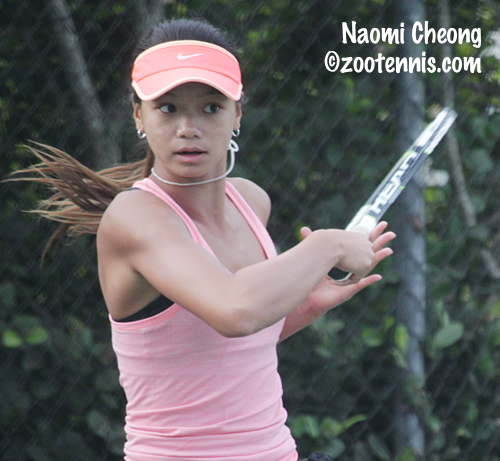 The Girls 16s still have all Top 8 seeds in the fourth round and even one of the unseeded players in the last 16, Junior Orange Bowl finalist Naomi Cheong, is hardly a surprise. In contrast, six of the 16 players left in the Boys 16s are unseeded. The biggest upset in the first three rounds was No. 2 seed Rebecca Weissmann's loss to unseeded Marybeth Hurley today. The TennisLink site for the 16s and 18s draws is here. The TennisLink site for the 12s and 14s draws is here. It's always a challenge to get the slideshows of the December Florida tournaments up in a timely fashion, with three events right in a row, but I've managed to get the Metropolia Orange Bowl up in two weeks time, although I've not had time to process the videos. Below are the 16s and 18s singles quarterfinalists and doubles semifinalists, who, with the compacted schedule due to the rain, didn't always get the recognition they should have during the tournament. My recap of the tournament for the Tennis Recruiting Network is available here. The album can be accessed on mobile devices here. I'm finally back home in Kalamazoo after my five weeks in North Carolina and Florida, finishing the last leg of the journey today. The USTA's selections for the big 14-and-under tournaments in Great Britain and France are always made while I'm in Florida and the names of the four girls and four boys are listed below, with links to their Tennis Recruiting Network profiles. This year both the girls and the boys had playoffs in Boca Raton, with eight players invited to play in a round robin competition, with the top four finishers receiving spots. The girls have not always had a playoff, but they did this year, and in a surprise to nearly everyone, Naomi Cheong, the Junior Orange Bowl finalist, didn't win a match in her round robin group. My understanding is that only way Cheong can play the Nike International in Bolton and Les Petits As in Tarbes next month is if she receives a wild card or is accepted into to qualifying. The acceptances for Bolton, which begins with qualifying on January 15th, should be available tomorrow at the Tennis Europe tournament website. Entries close on Tuesday for Les Petits As, which begins with qualifying on January 23rd. Tennis Europe has announced its Junior Tour singles Players of the Year for 2015. In the 14s, Timofey Skatov and Taisya Pachkaleva of Russia were the top players; in the 16s, the POY awards went to Marina Bassols Ribera of Spain and Leonid Sheyngezikht of Bulgaria. College tennis is still several weeks from resuming, but Bobby Knight at College Tennis Today is providing in-depth previews of the top men's Division I teams. So far he has looked at Virginia, Ohio State, TCU, UCLA, USC and Stanford and with all the information he presents, you can't help but be better informed by reading these posts. He has also posted a schedule for when he'll be posting previews of other top D-I men's programs. The seeds and draws have been posted for the USTA Winter Nationals, which begin on Sunday, December 27. Boys 18s top seed William Genesen is back to defend his title in Scottsdale, Arizona, where the boys and girls 16s and 18s division are played. The TennisLink site for those two age divisions is here. After three and a half action-packed weeks of reporting on junior tennis in Florida, I will be taking a couple of days off to share the holidays with my family. The next big tournaments are just around the corner however, with the USTA Winter Nationals set to begin on December 27th. 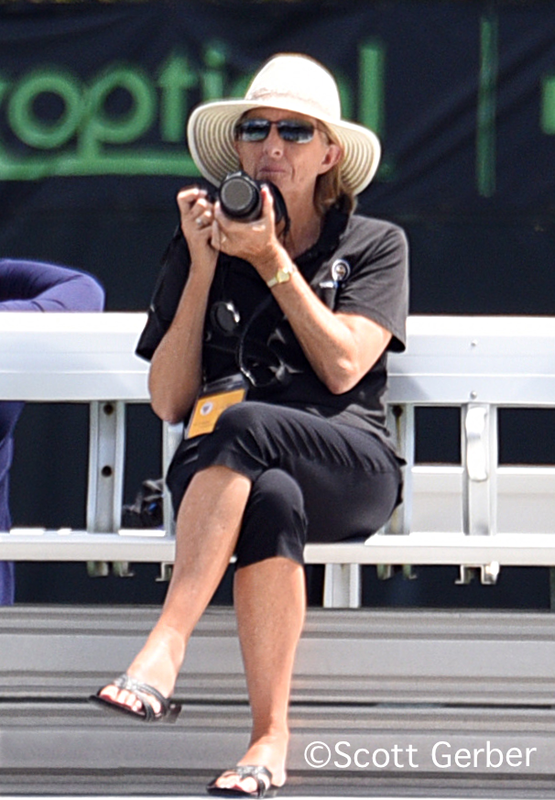 I won't be attending in person, but I will follow along from home while I work on the photographs and videos from the Florida tournaments and on my upcoming Tennis Recruiting articles, which will be based on interviews I did this month. 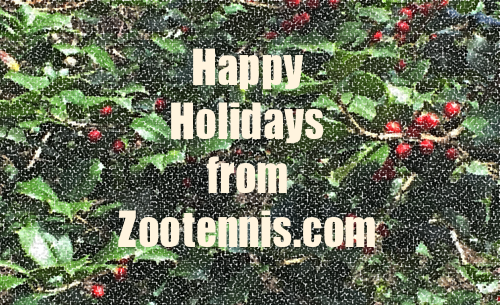 Thank you for reading during this busy time of year and I hope you have a chance to review all the coverage I've provided since Thanksgiving, before the junior tennis year starts up again in a few days. 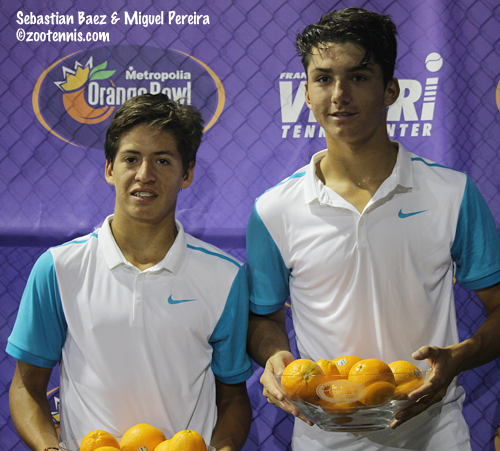 Two proud Ukrainian girls won Junior Orange Bowl titles on a warm and sunny Tuesday morning at the University of Miami's Neil Schiff Tennis Center, while Argentina picked up its third major junior title of the month in South Florida in the Boys 14s singles. No. 7 seed Dasha Lopatetska took the Girls 12s title, beating top seed and Eddie Herr champion Noa Krznaric of Croatia 7-5, 6-0, joining friend Marta Kostyuk in the winner's circle, after the fifth-seeded Kostyuk defeated Naomi Cheong of the United States 6-3, 6-4 in the Girls 14s final. 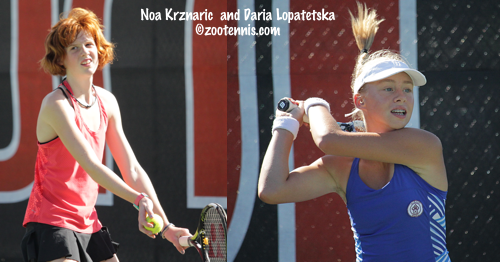 Krznaric had not lost a set in winning the Eddie Herr and in reaching the final of the Junior Orange Bowl, but Lopatetska stayed with her throughout the 70-minute first set. Lopatetska served for the set at 5-3, was broken at love, but she didn't let that derail her, and she held for a 6-5 lead. Krznaric, who frequently cries after losing a point, couldn't cope with the pressure of serving to stay in the set and she double faulted at ad-out. Two long games opened the second set, but when Lopatetska broke Krznaric in the second game, the outcome was decided. "In the second set, I played my best tennis," said Lopatetska, who lost in the first round of the Eddie Herr as the top seed, but did not lose a set this week. "She didn't know what to do with me, and I don't give her a chance to win. First set was very very tough, every point, every serve, every return and when I won it, I was, c'mon, you must win this trophy." The second set ended as the first did, with a Krznaric double fault, and 14s champion Kostyuk was the first to congratulate Lopatetska, meeting her on court after the handshake. "Marta is a great player for Ukraine, and we are very proud," said Lopatetska, who is spending the next five days in Boston with her coach and her coach's family before returning to Ukraine. "Marta and I will now play for our country, our parents, our club. This tournament is very important for me; it's the unofficial champion of the world, and it should help me to grow up, get ready for WTA and win all the grand slams." Kostyuk added the Junior Orange Bowl title to her Eddie Herr title, staging a big comeback in the second set, when Cheong had a 3-0, two-break lead. "I played very bad then," said Kostyuk, who lost eleven straight points from 30-15 up in the first game of the second set. "Maybe she started thinking, I can win, and she started doing more mistakes, so I was like, c'mon, let's go, you can do it." Cheong, one of the No. 9 seeds, agreed that once Kostyuk relocated her game, Cheong wasn't getting any free points. "I had to force her to make errors," said Cheong, who like Kostyuk is 13. "And she made even less errors after I went up 3-0. Of course you want them to miss, so you can get the points, but you have to learn how to earn it yourself. This was good for me, because I can get better at doing that. If I have chances, I need to take them." Kostyuk admitted she was worried when serving at 2-4 15-30 in the second set. "The first set was good, but the start of the second set was very bad.The score was 4-2 and it was very scary, I think," said Kostyuk, who is coached by her mother Talina Beiko, a member of the Ukrainian Fed Cup team in the 1990s, as well as another coach in Ukraine, where she will return for Christmas. Cheong saved three match points serving at 4-5, with Kostyuk showing signs of nerves with three unforced errors from 40-0 up. Cheong earned a game point with a forehand on the line, but she missed her next two forehands to give Kostyuk a fourth match point, and this time Kostyuk hung in the point until she got the short ball she wanted and finished with a backhand swinging volley winner. "It's unbelievable, I think," Kostyuk said of her Eddie Herr - Orange Bowl double. "It's a surprise. This is a big trophy for me and I think it is one step in my career. I think I can play better and better and better." Kostyuk is eligible to compete in Les Petits As next month, and with her two titles here in Florida, will be a favorite in Tarbes, a status she said she is perfectly comfortable with. 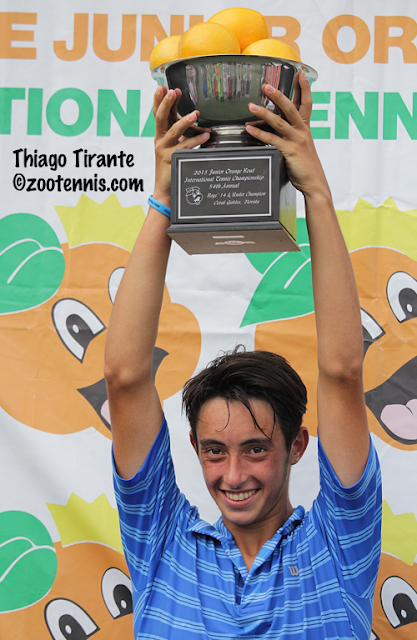 Top Boys 14 seed Thiago Tirante fell one match short of both titles, with the 14-year-old from Argentina losing in the final of the Eddie Herr before taking the Junior Orange Bowl title with a 6-2, 6-2 win over Anton Matusevich, a No. 17 seed from Great Britain. Tirante, who lost to Chun Hsin Tseng of Taiwain in the Eddie Herr final, needed to win a third-set tiebreaker in the second round of the Junior Orange Bowl to give himself a chance for redemption. "It took me a while to get adjusted in that first match," Tirante said in Spanish, with Miami Herald reporter Michelle Kaufman serving as translator. "I wasn't playing very well and I'm very thankful and grateful that I was able to pull it out, basically, with my heart, and it propelled me to this day." Tirante had not lost a set since, and he thoroughly dominated the final, using his serve and forehand to keep Matusevich on the defensive. Up early in both sets, Tirante had one brief misstep in the third game, when he was broken and Matusevich held for 2-2, but Matusevich was too inconsistent to keep up with Tirante and his last two service games were riddled with disheartening double faults. Even when up 5-2 in the second set, Tirante, who described himself as passionate and whose favorite ATP player is Australian ATP pro Nick Kyrgios, never lost his intensity, with the fist pumps and exhortations of vamos never flagging. 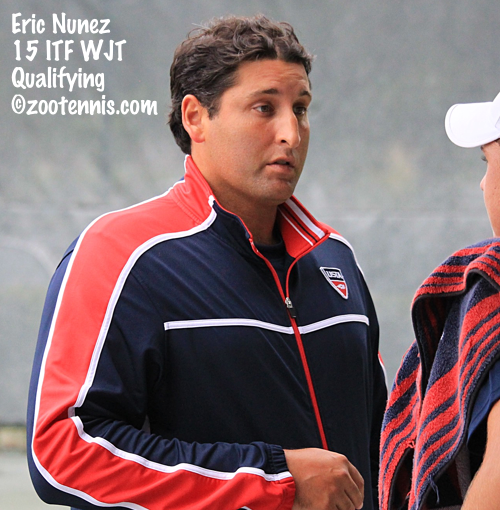 "This is one of the biggest junior tournaments, and it was a goal of mine to win here," Tirante said. "I'm very, very happy. It was a dream come true for me." Tirante's win is the third of the month for Argentina, with Maria Lourdes Carle and Sebastian Baez, who was on hand for the final, claiming the 16s titles at the Metropolia Orange Bowl nine days ago. 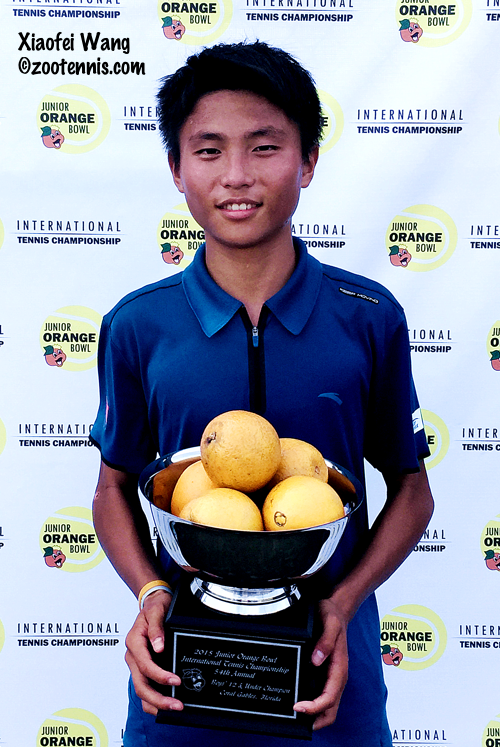 The boys 12s final, played on the Har-Tru courts at Salvadore Park, produced a second double, with Xioafei Wang of China adding the Junior Orange Bowl title to his Eddie Herr championship with a 6-1, 6-2 win over No. 8 seed Jewon Jeon of Korea. 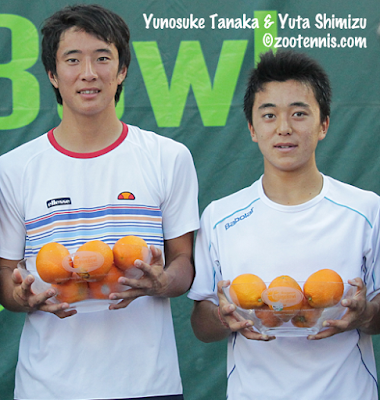 Wang, who won the Eddie Herr as a qualifier, was the top seed at the Junior Orange Bowl, and he lost only one set in his seven victories. Although score of the final appears lopsided, the match took nearly two hours to complete. In addition to the finals, the third place and consolation finals were played on Tuesday. At the Boys 12s at Salvadore Park, unseeded Alexander Bernard of the US took fifth place, beating No. 3 seed Hamad Nedjedovic of Serbia 6-4, 7-6(7). Eduardo Morais of Portugal had been awarded third place on Monday when Christopher Li of Peru of was unable to compete due to injury. In the Girls 12s, No. 4 seed Cori Gauff came from 6-0, 5-1 down to defeat No. 5 seed Charlotte Owensby 0-6, 7-5, 6-2 for third place. Fifth place went to No. 6 seed Yeonwoo Ku of Korea, who beat No. 3 seed Kylie Bilchev of Great Britain 7-5, 6-1. Third place in Girls 14s went to unseeded Yuki Naito of Japan, who defeated unseeded Loudmilla Bencheikh of France 6-2, 7-5. Unseeded Himeno Sakasume of Japan took fifth place, beating Qinwen Zheng of China 6-2, 0-6, 6-1. (The match should have been decided in a match tiebreaker, but was not). Unseeded Sebastian Grundtvig of Denmark took fifth place in the Boys 14s with a 6-2, 6-1 win over No. 7 seed Jack Draper of Great Britain, and Seon Yong Han of Korea, a No. 17 seed, defeated No. 4 seed Timofey Skatov of Russia 7-6(5), 6-4 to take third place. Two 13-year-olds will meet for the Junior Orange Bowl girls 14s title on Tuesday morning, with Naomi Cheong of the United States and Marta Kostyuk of Ukraine both coming back from a set down in Monday's semifinals at the University of Miami's Neil Schiff Tennis Center. Overnight rain delayed the start of play on Tuesday, and the two Girls 14s semifinals were sent to courts 5 and 6 rather than courts 1 and 2, which were occupied with consolation matches. No. 9 seed Cheong trailed 5-2 in the first set against unseeded Loudmilla Bencheikh of France, got it back to 5-all after Bencheikh had served for the set at both 5-2 and 5-4, but was broken at love, and Bencheikh converted on her third attempt to serve out the set. "In the first few games she played really good and I was a little off," said Cheong. "But it helped me get used to her pace and her ball a little better, and gradually during the match I started playing better. I was standing ten feet behind the baseline in the first couple of games, but then I started moving forward because I felt more comfortable hitting with her." After Cheong won the second set, during the 10-minute break, she spoke by phone to her coach in Las Vegas, Henner Nehles, who recently joined the USTA as a National Coach. "He told me she would be mad after losing the second set and she would come on strong in the third," said Cheong. "I won the second set, so I'm happy I'm alive but I needed to make sure that I didn't lose my focus during the beginning of the third." broke back to make it 3-3. "For some reason I lost focus and I started not playing my game, instead hoping she would make a mistake," said Cheong. "But I was making mistakes and she started attacking. At 3-all, I knew I couldn't keep on doing that because it would cost me the match. I was happy I didn't get stuck, because sometimes in a match I'll stop playing aggressive and it will cost me the match sometimes." Cheong continued to go for winners on Bencheikh's second serve and it paid off. She broke Bencheikh at love to go up 4-3 and held for 5-3. Serving to stay in the match Bencheikh fell behind 15-40, as Cheong made no unforced errors and Bencheikh eventually lost control of her forehand. On the first match point, Bencheikh missed her first serve and Cheong hit a forehand return winner off the second serve to seal the victory. No. 5 seed Kostyuk, like Bencheikh, twice served for the opening set against unseeded Yuki Naito of Japan, but her failure to convert either time did cost her the set. Yet the Eddie Herr champion kept her winning streak, now at 11 matches, alive, coming back for a 6-7(3), 6-3, 6-2 victory. Cheong and Kostyuk have not played before, but Cheong is excited about the prospect. "I think there will be nerves in the beginning, because it's a big tournament final," said Cheong. "But once I go on the court, I can't let it bother me. I have to make sure I play my game and not lose any focus, just concentrate." The boys 14s final will feature top seed Thiago Tirante of Argentina against Anton Matusevich of Great Britain, a No. 17 seed. Tirante defeated No. 4 seed Timofey Skatov of Russia 6-4, 6-4, while Matusevich closed out the afternoon's main draw activity with a 7-5, 7-5 win over Seon Young Han of Korea, also a No. 17 seed. Matusevich had not played Han prior to their semifinal meeting today, but he knew what to expect, after fellow Brit Jack Draper had lost to Han in the previous round. "I knew he was going to be massive and I needed to be on top of my game," said the 14-year-old. "I knew he'd hit some strong winners but also that he would give me some mistakes. He has a very good kick serve and he's very good with his drop shots. He played a good match, but I thought I was playing very well today." Long rallies were not in evidence during most of the match, with one player or the other making an error or hitting a winner usually before the ball was struck six times. Matusevich broke Han at love at 5-all and held to take the first set, then broke Han to start the second set, but that lead did not hold up. Han broke back to make it 2-2 and there were no breaks of serve until 5-all. Han was up 40-15 in the game, but Matusevich came up big with a forehand down-the-line winner at deuce and a return winner off a good first serve on break point. Matusevich held at love in the final game, with Han making forehand errors to assist Matusevich in closing out the match. Matusevich, who won the Nike International Teen Tennis Tournament in Bolton, England back in January, has lived in England for the past seven years, although he was born in New York and lived in the United States prior to moving to England with his family. He now works with the LTA and is here this week as part of the LTA traveling team. Matusevich and Tirante have not played before, but again Matusevich will be looking for tips from Draper, who lost to Tirante in the semifinals of the Eddie Herr. "My friend's played him, so he's probably going to tell me how to play him," said Matusevich. "He's a very good opponent, so I'll have to be sharp tomorrow. It should be quite tough. I've done very well, but obviously it'll be better if I win than come second." The Girls 12s final will, like the Girls 14s final, feature the Eddie Herr champion, with top seed Noa Krznaric of Croatia facing No. 7 seed Daria Lopatetska of Ukraine. In a rematch of the Eddie Herr final, Krznaric defeated No. 4 seed Cori "CoCo" Gauff 6-4, 6-4, while Lopatetska beat No. 5 seed Charlotte Owensby 6-4, 6-3. 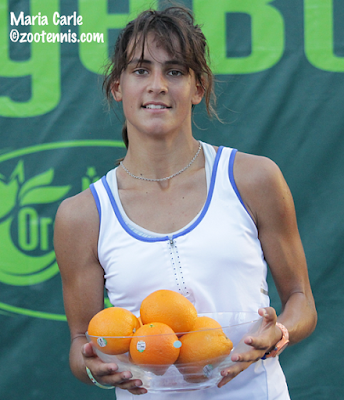 Lopatetska was the top seed at the Eddie Herr, but lost in the first round to Junior Orange Bowl No. 6 seed Yeonwoo Ku of Korea, who will be playing in the consolation final on Tuesday against No. 3 seed Kylie Bilchev of Great Britain. The Boys 12s final will also include the Eddie Herr champion, with No. 1 seed Xiaofei Wang of China taking on No. 8 seed Jewon Jeon of Korea. Wang advanced to the final when Christopher Li of Peru retired trailing 2-0 in the first set. Li had suffered an injury in his quarterfinal win over No. 3 seed Hamad Medjedovic of Serbia. Jeon defeated unseeded Eduardo Morais of Portugal 6-2, 7-6(3) in the other semifinal. Due to Li's injury preventing him from playing the third place match on Tuesday, Morais was declared the winner. The boys 12s consolation final for fifth place Tuesday will be between unseeded Alexander Bernard and Medjedovic. The Girls 14s consolation final will feature unseeded Himeno Sakasume of Japan against unseeded Qinwen Zheng of China. Jack Draper of Great Britain, the No. 7 seed, will play unseeded Sebastian Grundtvig of Denmark in the Boys 14s consolation final Tuesday. After saving two match points in her fourth round win on Saturday, Naomi Cheong anticipated another difficult match in the quarterfinals when she played top seed Ekaterina Makarova of Russia. But the 13-year-old from Las Vegas was able to post a 6-3, 6-3 victory by balancing aggressive play with patience on a cloudy and cool day at the University of Miami's Neil Schiff Tennis Center. "I was expecting to have a three- or four-hour match today because she's a tough player," said Cheong, a No. 9 seed. "She can stay out there all day, so I knew I just had to stay focused the whole time." Cheong was prepared for Makarova's high, looping topspin and her defense. "I did know she was going to do that the whole match," said Cheong. "But it's good for me too, because I can practice on my game and go for shots that I need to--taking volleys and overheads and swing volleys. So it was good, but I also had to be patient most of the time, because I can't let that distract me or lose focus." Several of the points between Cheong and Makarova on Court 1 were so long that balls from Court 2's match caused lets to be played. "At one point I did get mad, but I told myself I can't let it bother me," Cheong said. "Because if I let it bother me, she's going to know and take control of the match, and I can't let her do that." 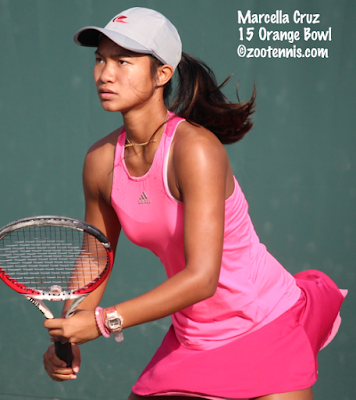 Cheong, who said she enjoys playing on show courts, won two ITF Grade 5 tournaments in the weeks before the Junior Orange Bowl, so her winning streak is now at 15, but it's a tournament prior to those titles that motivated her. "Right before the ITFs, we had this Les Petits tournament, with eight American players and they would take the top four to Les Petits," said Cheong. "I didn't do well, and I knew if I wanted to get better, I needed to keep practicing, do better, and yeah, I'm seeing the results." Cheong will play unseeded Loudmilla Bencheikh of France, who defeated No. 6 seed Anastasia Tikhonova of Russia 3-6, 7-5, 6-0. Unseeded Yuki Naito of Japan continued dominating, defeating 12-year-old Gabby Price, also unseeded, 6-0, 6-3. Naito will play Eddie Herr champion and No. 5 seed Marta Kostyuk of Ukraine, who advanced when Oana Corneanu of Romania was defaulted trailing 6-3, 5-3. Corneanu was given her first unsportsmanlike conduct penalty when she took a bathroom break but did not use the toilet. The second was for racquet abuse, and she was warned of her precarious situation after she was overruled twice on line calls by the roving umpire. (Chair umpires will be used beginning with the semifinals). When Corneanu was overruled a third time, the roving umpire called the site referee to the court, and after a brief discussion, Corneanu was defaulted. She dissolved in tears and several spectators loudly protested the decision, but eventually she and Kostyuk shook hands, although Corneanu continued to sob by her chair for several minutes. Because the default was for misconduct, she was also defaulted from the consolation tournament. The top half of the boys draw has played out as expected, with top seed Thiago Tirante of Argentina meeting No. 4 seed Timofey Skatov of Russia in one semifinal. Tirante defeated Mateus Alves of Brazil, a No. 17 seed, 6-1, 6-2 and Skatov eliminated the last unseeded player, Canada's Liam Draxl, 6-2, 6-1. The semifinal in the bottom half will feature two No. 17 seeds: Anton Matusevich of Great Britain and Seon Yong Han of Korea. Matusevich upset Les Petis As and Eddie Herr champion Chun Hsin Tseng of Taiwan 6-3, 2-6, 6-1. Matusevich, who won the big 14U tournament in Bolton in January under the US flag, took control in the third set. Tseng began to make unforced errors, an uncharacteristic mode for him, while Matusevich kept the pressure on with his pace and depth. Han defeated No. 7 seed Jack Draper 7-6(5), 6-1, and although Matusevich is physically imposing, Han is even more so, making for a decidedly non-14s look in their upcoming semifinal. The Girls 12s had the top eight seeds in the quarterfinals, but that form didn't hold, with No. 2 and No. 3 falling today. 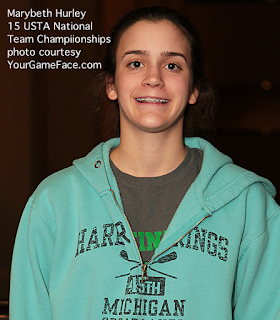 Eddie Herr champion Noa Krznaric of Croatia defeated No. 8 seed Anna Chekanskaya of Russia 6-3, 6-2 and still has not lost a set in the two Florida tournaments this month. She will play No. 4 seed Cori Gauff, who defeated No. 6 seed Yeonwoo Ku of Korea 6-3, 6-2, in rematch of the Eddie Herr final, won by Krznaric 6-3, 6-3. Charlotte Owensby, the No. 5 seed, defeated No. 3 seed Kylie Bilchev of Great Britain 1-6, 6-4, 6-0 and will play No. 7 seed Daria Lopatetska of Ukraine, who beat No. 2 seed Elvina Kalieva 6-2, 6-3. The Girls 12s semifinals and finals will be played at the University of Miami after the first five rounds were played at Tropical Park. No American players are left in the main draw of the Boys 12s at Salvadore Park after today's quarterfinals. Top seed Xiaofei Wang of China defeated Aidan Mayo 7-6(4), 6-4 and No. 8 seed Jewon Jeon of Korea defeated Alexander Bernard 6-4, 6-3 to end US interest. Wang will play unseeded Christopher Li of Peru, who beat No. 3 seed Hamad Medjedovic of Serbia 0-6, 6-2, 7-5, while Jeon meets unseeded Eduardo Morais of Portugal. Morais defeated unseeded Elmer Moller of Denmark 6-2, 2-6, 6-2 in a match that last three hours and 15 minutes. Because the Boys 12s is played on Har-Tru, they will complete their tournament at Salvadore Park. A cold front brought some rain Friday evening, but also some welcome relief from the high humidity of the first three days at the Junior Orange Bowl. By mid-morning a less welcome weather development emerged, with gusty winds creating serious difficulties for most of the players who didn't close out their morning matches quickly. No. 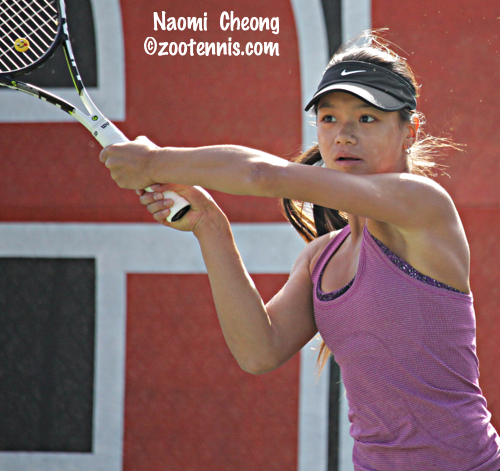 9 seed Naomi Cheong survived a serious challenge from unseeded Thasaporn Naklo of Thailand, saving two match points in her 6-3, 1-6, 7-6(6) victory at the University of Miami courts Saturday morning. Naklo served for the match twice, with her two match points coming at 5-4, 40-15, but Cheong eventually broke for 5-5. Cheong gave Naklo a second chance to serve for the match, but Naklo didn't get any closer than 30-40 in her second try. The tiebreaker saw more wind-induced shanks than winners, but Naklo managed to fight back from 6-3 down to even it at the change of ends. Cheong hit her second backhand down-the-line winner to earn match point No. 4 and she converted it when Naklo netted a forehand reply to Cheong's off-balance first-serve return. "It was really lucky," Cheong said of her backhand winners in the tiebreaker, "because my backhand was kind of off today. I was hitting the top of the net on a lot of them. But I just had to keep going for it, so it would get better." Cheong, who won two ITF Grade 5 titles the last week of November and first week of December, said training in Las Vegas helps her know how to cope with windy conditions. "I'm from Las Vegas, where it's really windy all the time," said the 13-year-old, who was a finalist this year at the USTA National 14s. "It's more of a mental game, so you have to stay strong, play with the wind, let it be your partner. You can use it to your advantage--you don't have to go for such a big shot. I think I got used to it quicker than she did." Cheong is happy to advance to the quarterfinals in the 14s, after losing in the second round of Junior Orange Bowl 12s last year. "I haven't done well, but I want to make this year a little different," Cheong said. Although Cheong and Naklo played nearly three hours, it was nowhere near the longest match of the day. Top seed Ekaterina Makarova of Russia spent four hours on the court before finally subduing No. 9 seed Himari Sato of Japan, a finalist in the 12s division last year, 6-7(3), 7-6(6), 6-4. Makarova will play Chong in Sunday's quarterfinals. On the other end of the match duration spectrum, unseeded Ludmilla Bencheikh of France defeated No. 3 seed Luniusca Delgado of Venezuela 6-1, 6-0 in well under an hour, using her powerful game to keep Delgado on the defensive the entire match. Bencheikh will play No. 6 seed Anastasia Tikhonova of Russia in the quarterfinals. Eddie Herr 14s champion Marta Kostyuk of Ukraine, the No. 5 seed, will face No. 9 seed Oana Corneanu of Romania. Corneanu, a heavy-hitting left-hander, defeated No. 4 seed Katie Volynets 6-1, 7-5. The fourth quarterfinal match will be between two unseeded players, Yuki Naito of Japan and Gabby Price. Naito, with a 134 ITF world junior ranking, had her toughest match yet, but still got by unseeded Chloe Beck 6-2, 6-4. Twelve-year-old Gabby Price, who beat No. 2 seed Alexa Noel in the second round on Thursday, continued her strong play with a 6-3, 6-3 win over unseeded Giulia Morlet of France. 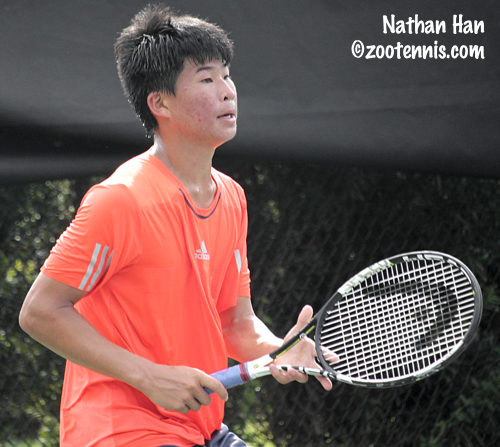 The last US boy in the 14s main draw was eliminated today, with Nathan Han, a No. 9 seed, falling to No. 7 seed Jack Draper of Great Britain 7-5, 6-4. Top seed Thiago Tirante of Argentina, No. 3 seed Chun Hsin Tseng of Taiwan and No. 4 seed Timofey Skatov of Russia all advanced to the quarterfinals. The quarterfinals in the G12s will feature three Americans, and the eight top seeds, a rarity in any tournament, let alone one in Girls 12s. No. 4 seed Cori Gauff, No. 5 seed Charlotte Owensby and No. 2 seed Elvina Kalieva all advanced to the quarterfinals with straight-set victories. Top seed Noa Krznaric of Croatia and No. 3 seed Kylie Bilchev of Great Britain also won their round of 16 matches in straight sets. In fact the only three-set match in the 12s was Russian No. 8 seed Anna Chekanskaya's 2-6, 6-4, 6-4 victory over qualifier Alexandra Yepifanova. The boys 12s quarterfinals will feature two Americans and only three seeded players. Aidan Mayo, who took fifth place last year in the 12s division, defeated No. 7 seed Benjamin Kittay 6-3, 6-2 in the all-American match. Mayo will next face top seed Xiaofei Wang of China, who defeated unseeded Martin Damm 7-5, 6-1. Unseeded Alexander Bernard is the other US quarterfinalist. He advanced to a quarterfinal meeting with No. 8 seed Jewon Jeon of Korea when Marko Stakusic of Canada retired with an injury, trailing 6-2, 3-0. No. 2 seed Hugo Hashimoto was beaten by unseeded Elmer Moller of Denmark 7-6(6), 6-2. No. 3 seed Hamad Medjedovic of Serbia, who will play unseeded Christopher Li of Peru, is the third seed in the quarterfinals. Moller will play Eduardo Morais of Portugal in the only quarterfinal without a seed. Morais defeated Jon Suntar of Slovakia in a three-hour plus match, 5-7, 7-5, 6-4. I ventured out the Crandon Park on Key Biscayne today to watch the round of 32 of the Boys 14s. Unseasonably warm and humid weather this week, as well as the occasional rain shower, has caused problems at the four sites, and wet courts from overnight dew delayed the start of play today for more than an hour. No. 2 seed Govind Nanda lost to No. 17 Seon Yong Han of Korea, retiring after a back injury worsened in the second set. Nanda won the first set 6-4, then Han, who led Korea to the ITF World Junior Tennis team title in August, took advantage of Nanda's lack of mobility to win the second set 6-2. Han, who is physically mature beyond his years, led 2-0 in the third set when Nanda retired. Once I looked in on all the main draw matches, I settled on the only all-American round of 32 match, with No. 9 seed Nathan Han playing unseeded Daniel Sharygin. The day started with 11 American boys still in the main draw, but when it ended, only Han remained, after a tense and physical 6-4, 4-6, 7-5 battle. Both Han and Sharygin were going for their shots, with the errors they made usually the result of that aggression. Sharygin, a 14-year-old left-hander from Indiana, jumped out to a 3-0 lead in the second set, but Han countered with four straight games, only to have his forehand let him down in the final three games, which were won by Sharygin to secure the set. Sharygin took a 4-2 lead in the final set, but as in the second set, Han fought back, taking the next three games to get an opportunity to serve for the match. Han went down 0-30, but won the next three points to earn a match point, but Sharygin unleashed a forehand winner to save it. Another forehand winner, on a crosscourt pass, gave Sharygin a break point and he made it 5-all when Han netted a backhand on the third ball of the point. Sharygin immediately went down 0-40 in the next game, but saved those three break points and another, but it was then that a cramp in his left leg began to hinder his movement. His attempt to shorten points resulted in two quick forehand winners, but on the second of two more break points, Sharygin missed an overhead and Han would serve for the match again. After a Sharygin forehand return went long, Han had his second match point at 40-15, but he missed a backhand lob long. Match point number three marked the end of the two and half hour match, with Sharygin sending a forehand long. An affectionate hug during the handshake showed the respect both players had for the effort the other gave. For Han, it was his third straight match to go the distance. "I have a lot of confidence in third sets and that really helped me get through these matches," said the 14-year-old from Oklahoma, who won the USTA 14s Nationals this August. Han tried every strategy he could think of down 4-2 in the third set. "I was like, go to Plan Z," said Han, who was 1-1 in his head-to-head with Sharygin. "I'm not playing my best tennis, but I'm trying to do anything to win really. Ugly tennis, slicing, moonball, hustle, trying to find a way out." As for keeping his focus when he saw Sharygin was cramping, Han managed to control his thoughts. "You feel like it's unfair, but you can't do anything about it," Han said. "You've got to just keep competing really. Sometimes people start missing, get really tight, so I just try to ignore it as much as possible." Han will play No. 7 seed Jack Draper of Great Britain in the round of 16. Draper also needed three sets to advance Friday, beating No. 17 seed Nini Dica of Romania 6-7, 6-0, 6-1. Top seed Thiago Tiriante of Argentina, No. 3 seed Chun Hsin Tseng of Taiwan and No. 4 seed Timofey Skatov of Russia all advanced in straight sets. Four US girls remain in the 14s round of 16: No. 9 seed Naomi Cheong, No. 4 seed Katie Volynets and unseeded Chloe Beck and Gabby Price. Beck and Price are part of the bottom quarter that has no seeded players remaining, but it does include Yuki Naito of Japan, who is 134 in the ITF Junior world rankings. Five US boys and five US girls are into the round of 16 in the 12s division. The five US girls are No. 2 seed Elvina Kalieva, No. 4 seed Cori Gauff, No. 5 seed Charlotte Owensby and unseeded Ellie Coleman and qualifier Alexandra Yepifanova. Top seed Noa Krznaric of Croatia and No. 3 seed Kylie Bilchev of Great Britain also advanced with routine wins. The boys advancing to the 12s round of 16 Saturday are No. 2 seed Hugo Hashimoto, No. 7 seed Benjamin Kittay and unseeded Martin Damm, Alexander Bernard and Aidan Mayo. Mayo, who defeated No. 9 seed Ashton Cross of Canada 6-4, 6-4, will play Kittay in the only all-American match. Damm, who beat No. 9 seed Pedro Boscardin Dias of Brazil 6-4, 6-4, will play top seed Xiaofei Wang of China Saturday morning. 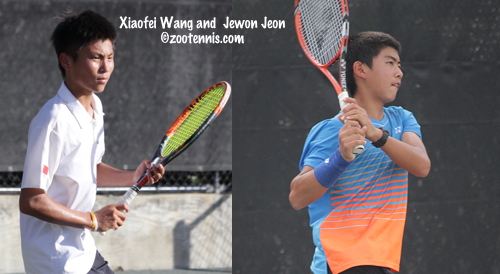 The two played in the quarterfinals of the Eddie Herr, with Wang winning 6-2, 6-4. Complete draws are available at the TennisLink site. 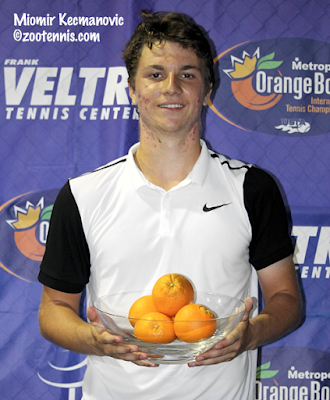 Before I head out to Key Biscayne's Crandon Park for the Boys 14s round of 32 this morning, here's a link to my look back at last week's Metropolia Orange Bowl for the Tennis Recruiting Network. With four sites, odds are that I'll miss the day's big upset, and that was the case Thursday, when 12-year-old Gabby Price defeated No. 2 seed Alexa Noel 6-3, 6-7(4), 6-0 in the second round of Girls 14s at the University of Miami. Noel was the only Top 4 seed to lose today, with No. 1 Ekaterina Makarova of Russia, No. 3 Luniusca Delgado of Venezuela and No. 4 Katie Volynets advancing to Friday's third round. After a close call for Thiago Tirante of Argentina in the second round Wednesday, the top seed advanced in straight sets in Thursday's third round. No. 2 seed Govind Nanda, No. 3 seed Chun Hsin Tseng of Taiwan and No. 4 seed Timofey Skatov of Russia also advanced in straight sets. No. 5 seed Will Grant was beaten by 2014 Eddie Herr 12s champion Jung Won Park of Korea 6-3, 6-4. I spent all day at the Boys 12s at Salvadore Park, where all the seeds in action won their second round matches, and only two of the 32 matches split sets. A big upset was averted in the day's final match, with No. 1 seed and Eddie Herr champion Xiaofei Wang of China needing two and a half hours to subdue Tomas Moretto of Argentina 7-6(5), 3-6, 6-0. Moretto was just as aggressive as Wang, handling the depth and pace of the top seed and capable of hitting winners when he got a short ball or had Wang leaning the wrong way. The final set score looks like a blowout, but all the points and games were close, with Wang converting his opportunities, while Moretto made a few key errors. The two seeded Americans, No. 7 seed Benjamin Kittay and No. 2 seed Hugo Hashimoto, got through competitive matches in straight sets, with nine other US boys advancing to the third round, including two qualifiers: Fnu Nidunjianzan and Evan Wen. Kittay will play Wen in Friday's third round, with two other all-American matches, Hashimoto against Adit Sinha and Alex Han against Alexander Bernard, also on the schedule. 2014 12s consolation winner Aidan Mayo will play No. 9 seed Ashton Cross of Canada; Isaac Smith will face Christopher Li of Peru, James Delgado will play No. 8 seed Jewon Jeon of Korea and Martin Damm will face No. 9 seed Pedro Boscardin Dias of Brazil. Damm, the son of the former ATP Top 50 singles player and 2006 US Open doubles champion from the Czech Republic, is a 6-foot-2 left-hander, two advantages he seeks to use against his opponents. "I'm a little stronger than them, they don't have as much power," said Damm, who lives in Bradenton, Florida and trains with Ashley Hobson at the Inspiration Tennis Academy there. "And with being left-handed, I have the out-wide serve, the forehand to the backhand, so I think it is an advantage." Against Jala Sadek of Lebanon, Damm admitted to a bit of a lapse after a routine first set, but he recovered, winning the final four games in a 6-2, 6-3 victory. "I just needed to focus more, get the ball in," said Damm, who was coached by his father prior to joining Inspiration Academy 18 months ago. "Not do mistakes, not go for big shots, just roll it high, and it worked." Damm said he still works with his father when he is not traveling, but his father's ATP coaching jobs, which currently include working with Leander Paes and Blaz Rola, don't give him much time at home in Bradenton. As for not being seeded, Damm, who reached the quarterfinals at Eddie Herr, losing to eventual champion Wang, doesn't let it bother him. "It does not matter to me," said Damm, who will face Wang in the round of 16 if both win on Friday. "I just play whoever I play, and I try to do my best." At the Girls 12s at Tropical Park, the top four seeds--No. 1 Noa Krznaric of Croatia, No. 2 Elvina Kalieva, No. 3 Kylie Bilchev of Great Britain and No. 4 Cori Gauff--all advanced to the third round without little difficulty. The No. 1 seeds in the 14s age division won their first Junior Orange Bowl matches, with Thiago Tirante of Argentina prevailing in a third-set tiebreaker and Ekaterina Makarova of Russia taking her match 6-1 in the third set. Makarova, in an 8 a.m. match at the University of Miami courts, defeated qualifier Anastasia Poplavaska of Ukraine 6-4, 4-6, 6-1, while Tirante survived against 2014 Boys 12s semifinalist Daiki Yoshimura of Japan 6-7(5), 6-4, 7-6(5) in a second round match played at Crandon Park. Eddie Herr Boys 14s champion Chun Hsin Tseng of Taiwan had an easier time in his opening match, a 6-2, 6-3 second round victory over Shunya Maruyama of Japan. I spent the morning at the Boys 12s at Salvadore Park, where just one top 8 seed lost. Eddie Herr semifinalist Jacobi Bain of the Bahamas, seeded No. 5, lost to Christopher Li of Peru 7-6(7), 6-3. A top four seed exited before playing a point however, as Eddie Herr finalist and USTA 12s National Champion Saud Alhogbani withdrew due to an illness. Eddie Herr champion Xiaofei Wang of China defeated Ryan Colby 6-2, 6-3, using his volleying skills to avoid the grinding Har-Tru points often prevalent in the Boys 12s. At Tropical Park, the top three seeds in the Girls 12s didn't lose a game in their opening matches. Eddie Herr champion and No. 1 seed Noa Krznaric of Croatia, No. 2 seed Elvina Kalieva, and No. 3 Kylie Bilchev of Great Britain blanked their opponents, while No. 4 seed Cori Gauff, the Eddie Herr 12s finalist, won her match over Jimin Kwon of Korea 6-1, 6-2. The University of Miami was a busy place on the hot and humid first day of the tournament, with both girls and boys filling the 14 hard courts from 8 a.m. until well after 8 p.m.
Eddie Herr Girls 14s champion Marta Kostyuk of Ukraine had difficulty early in her first round match with Gabriela Giraldo of Colombia, but pushed through for a 6-4, 6-2 win. No. 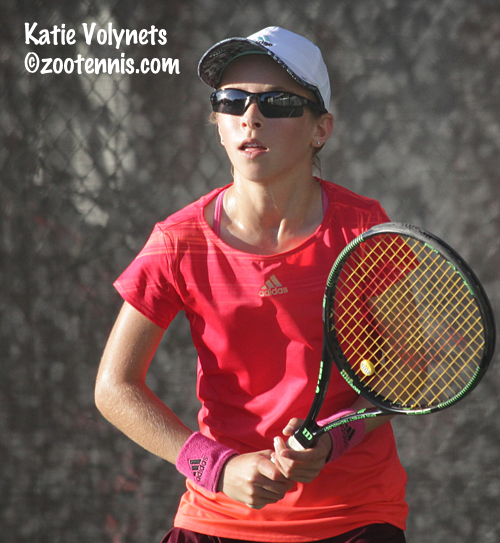 4 seed Katie Volynets, the USTA 14s champion, made her international debut, beating Tina Smith of Australia 6-1, 6-2. The first set was not a difficult one for Volynets, whose aggressive style was difficult to counter. After going up 4-0 in the second set, Volynets missed a few more balls, and Smith, who tried every strategy should could think of, would not give in. Smith demonstrated that at 4-0, when in a game that lasted nearly 20 minutes, she held serve to get on the board in the second set. "In that one game, I kind of lost my focus a little bit," said Volynets, who will turn 14 on New Year's Eve. "I would win the deuce point and she would win the ad point. It got a little tougher because the points got longer, but I pulled it out because I kept being aggressive." After holding in that marathon game, the left-handed Smith quickly broke Volynets, but Volynets got the break right back and served for the match at 5-2. Down 30-40, Volynets saved the break point with a backhand volley winner, then closed it out with good forehands, with a cross court short-angle winner on match point. At barely 5-feet tall, Volynets has developed her game to counter the constant moonballing tactics she faces. "I love taking the ball on the rise," said the Walnut Creek, California resident. "People like to moonball against me because they see I'm not very tall, so I like to come in and take it as early as possible. And I also love returning serves." Volynets said she is enjoying her first exposure to international players. "It's really nice to play new people I haven't seen before," Volynets said. "Different places have different styles and it makes me learn a lot." Volynets tries to determine her opponent's strengths and weaknesses during the warmup, and if she hasn't discovered them by then, can usually pick it up in the first few games. "I start playing the way I want to play when I don't know my opponent, then I figure it out on the court," Volynets said. Round of 64 matches are scheduled for all four sites on Thursday. For complete results, see the TennisLink site. The semifinalists in singles and finalists in doubles from the Eddie Herr are featured in this slideshow. With all the finals played at the same time, it's difficult for me to cover them adequately, but I hope this provides some recognition for the top performers at one of the most important junior tournaments of the year. Videos will be processed next month, when I am home and have more time and bandwidth. The album can be accessed from mobile devices via this link. 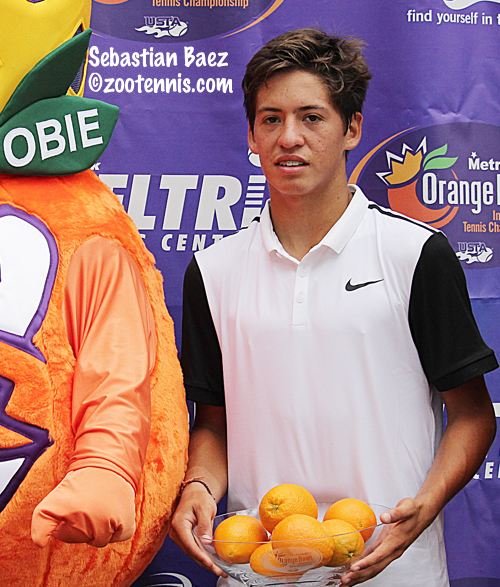 The Junior Orange Bowl draws have been released, with play beginning Wednesday at four sites: Boys 12s at Salvadore Park, Girls 12s at Tropical Park, Boys 14s at Crandon Park, Key Biscayne and Girls 14s at the University of Miami. Usually the girls 14s are at Crandon Park, but with the 192 draw for the Boys 14s this year, more courts are needed, for them, especially with the unavailability of the Biltmore courts, which are under renovation. I believe all divisions except the boys 12s, which are played on Har-Tru, will play the final two days at the University of Miami. The tournament ends on December 22nd this year, one day earlier than usual. Seeding in the 12s and 14s is always difficult, with limited cross play among countries and no global ranking system. And with only 16 seeds in a 128-draw, there aren't many seeds available period. That said, the committee didn't seed USTA 12s champion Nikki Yanez, who reached quarterfinals at the Eddie Herr, nor did ITF No. 134 and Grade A Osaka Mayors Cup finalist Yuki Naito of Japan receive a Girls 14s seed. Naito played 18s at the Eddie Herr and Orange Bowl and she is in the same quarter as Noel, as is Kacie Harvey, another strong ITF player who is not seeded. It's hard to imagine just what Chun Hsin Tseng of Taiwan would have to do to get a No. 1 seed after winning Les Petits As and the Eddie Herr this year, but at least he is among the top four seeds. Complete draws and times for Wednesday's matches are at the TennisLink site. The ITF released the 2015 year-end rankings today, with US Open junior champions Taylor Fritz of the United States and Dalma Galfi of Hungary finishing as ITF World Junior champions. They will be honored at an ITF dinner in Paris held during the French Open in June. 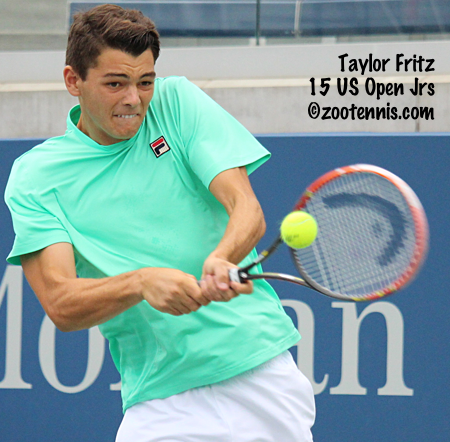 Fritz very much wanted to win the title, and he admitted when I talked to him in Champaign last month that he was keeping an eye on who had entered the final big junior tournaments of 2015, although, after he won two Challenger titles, there was never a suggestion that he would return to junior competition. As it happened, the players with the best chance of catching Fritz didn't play in the final clay swing, and the 18-year-old Californian ran away with the title, amassing 1356.88 points compared to No. 2 Casper Ruud's 985.00. Fritz is the first US boy to finish at No. 1 since Donald Young in 2005. Galfi's win was much closer, as the 17-year-old edged Marketa Vondrousova of the Czech Republic, who did not play any junior events after the US Open. Galfi's total of 1168.75 was just 15 points more than Vondrousova's 1153.75. She is the first Hungarian to be named ITF World Junior champion. In addition to the prestige, there are tangible benefits for finishing first, second, Top 5 and Top 10, which I'm including below*. The Top 5 girls also benefit from "merited increases" in the number of ITF/WTA tournaments they can play, which are limited according to age. To be eligible for a year-end ranking a junior must have played in a minimum of six individual junior singles tournaments, including at least three Grade A (Super Series) tournaments and including at least three ranking tournaments outside his/her own country. Each Grade A (Super Series) tournament won will count as two tournaments played. Each Grade A (Super Series) tournament won will further count as one foreign tournament played. *The year-end number 1 ranked girl will be offered direct entry into the Main Draw at one (1) ITF Women’s Circuit tournament up to and including $100,000 prize money level and two (2) ITF Women’s Circuit tournaments up to and including $75,000 prize money level. The year-end number 2 ranked girl will be offered direct entry into the Main Draw at two (2) ITF Women’s Circuit tournaments up to and including $75,000 prize money level and direct entry into the Main Draw at one (1) ITF Women’s Circuit tournament up to and including $50,000 prize-money level. The year-end number 3-5 ranked girls will be offered direct entry into the Main Draw at two (2) ITF Women’s Circuit tournaments up to and including $50,000 prize money level and direct entry into the Main Draw at one (1) ITF Women’s Circuit tournament up to and including $25,000 prize money level. The year-end number 6-10 ranked girls will be offered direct entry into the Main Draw at three (3) ITF Women’s Circuit tournaments up to and including $25,000 prize money level. Should any girl(s) ranked 1-10 not wish to participate in the Junior Exempt Project, their three junior exempt places can be awarded to the next highest year-end ranked player(s) ranked 11-15. Such player(s) will be offered direct entry into the Main Draw at three (3) ITF Women’s Circuit tournaments up to and including $25,000 prize-money level. The year-end number 1-2 ranked boys will be offered direct entry into the Main Draw at three (3) ITF Men’s Circuit tournaments up to and including $15,000+H prize-money level. The year-end number 3-5 ranked boys will be offered direct entry into the Main Draw at three (3) ITF Men’s Circuit tournaments up to and including $15,000 prize-money level. The year-end number 6-10 ranked boys will be offered direct entry into the Main Draw at three (3) ITF Men’s Circuit tournaments at $10,000 prize-money level. 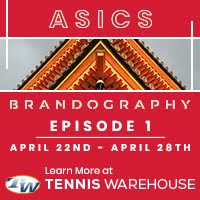 Bobby Knight is attending the ITA Convention in Naples and has written up an account of some of the discussion during the Division I strategy sessions for his College Tennis Today blog. Ulises Blanch was the subject of this Bradenton Herald feature, which explains why the 17-year-old, who trains in Argentina, is so comfortable traveling all over the world. You're unlikely to find a more global background anywhere. Clever headline too. 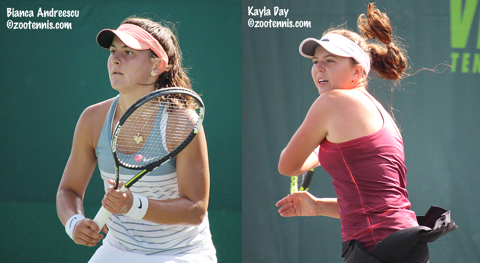 Labels: College Tennis, ITA, Junior Profiles U.S.
Kayla Day and Bianca Andreescu met in the final of the ITF Grade 1 Yucatan Cup just two weeks ago, while Stefanos Tsitsipas and Miomir Kecmanovic played last week in the quarterfinals of the Eddie Herr. 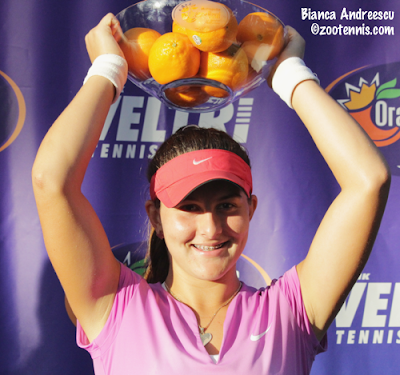 On Sunday, in the finals of the Metropolia Orange Bowl, Andreescu and Kecmanovic will be trying to reverse the results of those matches to win their first Grade A titles. The ninth-seeded Andreescu has nothing but positive memories to propel her, having now won 11 straight matches on the Har-Tru courts at the Frank Veltri Tennis Center. 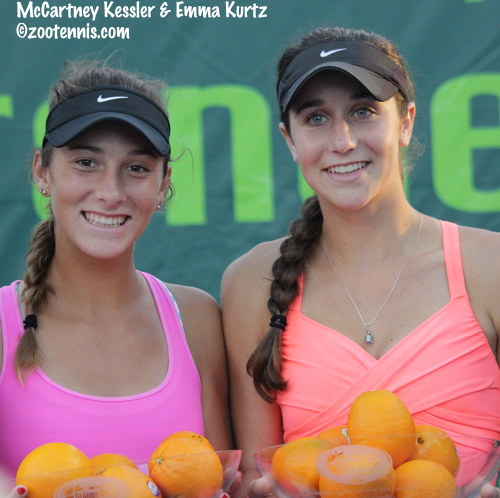 The 2014 girls 16s champion was having difficulty grasping that she's in another Orange Bowl final, with the 15-year-old Canadian celebrating her 2-6, 6-4, 6-2 win over No. 2 seed Dalma Galfi of Hungary, with the classic hand-over-open-mouth gesture of surprise. "It was like, did this just happen?," said Andreescu, who broke Galfi, the US Open girls champion, three times in the final set. "I feel like I played my best tennis in this match, ever. Not in the first set, but in the second and third. It was amazing. No words." Day was also in something of a daze following her victory over No. 13 seed Anastasia Potapova of Russia, who retired at 5-7, 6-3 after injuring her right hand in a fall late in the second set. "I am in shock and I also feel really bad for her," said Day. "I thought it was a good match and it's never easy to go out like that. It doesn't feel that great for me, it's kind of sad that we didn't get to finish." Day got off to a quick start on another warm and humid day in South Florida, breaking the 14-year-old Russian in her first two service games. Potapova wasn't playing particularly well, but by the seventh game, she had found her form and she broke Day serving for the set at 5-4 with a backhand down-the-line winner at 15-40. Serving at 5-6, Day was not about to be steamrolled, and she saved three set points, but on the fourth, Potapova's backhand down the line again found its mark. After winning the first two games of the second set, Potapova had won six straight games, but Day found a reason for hope in the third game. With Potapova serving at 30-40, the two produced one of the best points of the tournament, with drop shots, lobs, volleys, overheads, overhead returns all in evidence. Although Potapova won the point, she ended up losing the game, and Day was back in the match. "She won that, but after that point, I saw her sort of bend over even though she won it," said Day, a 16-year-old from Santa Barbara, California. "It looked like she was cramping, so I really started firing up, okay, I can do this." With Potapova serving at 3-3 in the second set, she fell, landing awkwardly on her right hand, and ending up losing that game, and the next two as well. "She got back up right away, and played the point, but her thumb, I think, just kept getting worse," Day said. "I started playing to her forehand, because I knew it was not doing well. I thought we'd continue when she came back from the bathroom (after Day won the set), but she couldn't even open up her hand." Day defeated Andreescu 7-5, 6-3 on the red clay at the Yucatan Cup final, but Andreescu said she learned from that loss, although what she learned she said was "top secret." Both Day and Andreescu will be playing in their first Grade A final Sunday. The third newcomer to Grade A finals is Kecmanovic, who defeated unseeded Calin Manda of Romania 6-4, 6-2. The ninth seed has dropped only one set in the tournament and even his lack of familiarity with his opponent didn't give him pause in the semifinals. "I saw him a couple of times a couple of months ago, but I didn't see a lot, so I didn't know that much about him," said the 16-year-old, who has trained at the IMG Academy in Bradenton for three years. "The start is always tougher, because you don't what to play, so you have to figure it out quick. The first couple of games I just stick to the basics, go backhand, open the court and see what happens. It turned out good." As for the rematch with Tsitsipas, won by the Greek 6-2, 7-6(4), Kecmanovic is looking forward to it. "I've been playing good this whole week," said Kecmanovic. "At the Eddie Herr, I lost that match, but we'll see if it'll be different. I know how to play him now and I hope it's going to be better." The third-seeded Tsitsipas, who lost to Stefan Kozlov 2-6, 6-3, 6-2 in last year's final, still has regrets from that match. "Last year I had many opportunities to win this tournament, but I didn't use them," said the 17-year-old, who has also lost only one set this week. "That's why I lost the final. This year I'm looking forward to winning the title." Tsitsipas was 0-3 against semifinal opponent Mate Valkusz of Hungary, the No. 2 seed, before today's 6-3, 6-1 victory, so he was especially pleased with the result. "It feels really good, especially with such an easy score," said the 6-foot-4 right-hander. "I don't think he was in the best shape today. It happens to everyone. At the end of the day (Friday), I was really tired, because I played two singles and one doubles, but despite this, I managed to win today." The doubles finals are set for Sunday, with no US players in either the boys or the girls finals. Yuta Shimizu and Yunosuke Tanaka of Japan defeated Jack Mingjie Lin of Canada and Oliver Crawford 7-6(6), 6-3 in Saturday afternoon's semifinals and will play Ergi Kirkin of Turkey and Alexei Popyrin of Australia in the final. Kirkin and Popyrin beat No. 5 seeds Youseef Hossam of Egypt and Alberto Lim of the Philippines 6-7(6), 6-3, 13-11. In the girls doubles, Eleni Christofi of Greece and Anastasia Detiuc of Moldova will play No. 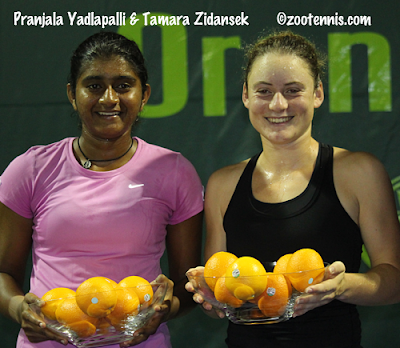 5 seeds Pranjala Yadlapalli of India and Tamar Zidansek of Slovenia for the title. Christofi and Detiuc defeated Jaqueline Cristian of Romania and Michaela Gordon 6-4, 7-5, with Yadlapalli and Zidansek beating Eddie Herr champions and No. 4 seeds Sonya Kenin and Ingrid Neel 6-4, 2-6, 10-7. In the 16s, Argentina has an opportunity to win both singles titles. No. 2 seed Maria Carle defeated unseeded Hannah Lairmore 6-1, 6-1 in the semifinals and will play qualifier Gabriela Tatarus of Romania for the girls title. Tatarus beat qualifier Lea Ma 6-2, 6-1 to advance to the final. Sebastian Baez, the No. 9 seed, eliminated Kyrylo Tsygura, the only US boy to reach the quarterfinals, 6-4, 6-4 and will play No. 3 seed Karl Friberg of Sweden for the boys title. Friberg defeated qualifier Nicolas Mejia of Colombia 6-2, 6-3. Three US players remain in the running for a doubles title. The unseeded Atlanta-area pair of McCartney Kessler and Emma Kurtz reached the final with a 6-2, 6-3 win over No. 5 seeds Emma Decoste and Ann Li. They will play No. 4 seeds Ania Hertel of Poland and Mihaela Marculescu of Romania, who beat Lairmore and Alana Wolfberg 6-7(4), 7-6(4), 10-8. Brian Shi, who with Canadian Nicaise Muamba, is seeded second, will play Baez and Miguel Pereira of Chile, the No. 3 seeds in the boys final. Shi and Muamba defeated No. 4 seeds Andrew Fenty and Tristan McCormick 7-6(5), 3-6, 14-12, while Baez and Pereira downed unseeded Trey Hilderbrand and Keenan Mayo 6-1, 3-6, 10-5 in the other semifinal. Sunday's order of play and the link to live scoring is available at the tournament website.